As we get further along rock’s progression we’ll start seeing less and less of these “hybrid” (“are they or aren’t they rock?”) songs popping up on the scene. That’s to be expected. The genre will start to shed its more overt similarities to styles that preceded it and as it does those who retain too much of a link to those earlier pre-rock motifs simply won’t cut it any longer and will be shunned by the growing rock community itself for aiming too far outside its core aesthetics. But for now, and a little while longer at least, there’s still going to be a handful of records that are able to qualify for inclusion here simply because rock itself hasn’t completely broke from its origins and those who straddle the line, but lean towards rock, will be more welcome. Todd Rhodes is one of those who bridged both styles and with Walkie Talkie we have the added advantage of studying an established song from the preceding style to show how he reconfigured it for a different audience which justifies its presence in the rock realm. Rhodes backstory, as delved into when we first encountered him on Blues For The Red Boy, is quite extensive. From his work as a pianist in the twenties in a popular syncopated jazz group and his subsequent long and arduous climb from a club attraction in Detroit once he struck out on his own, to emerging years later as the bandleader of one of rock’s first top flight ensembles, there’s not much in the music field of the early to mid-20th Century that Todd Rhodes did not encounter firsthand. That he made the choice to cast his fate in with this new unproven field populated by young, mostly inexperienced, artists, aiming at a similarly young and restless audience when he himself was nearing fifty years of age is quite admirable. That he succeeded in doing so to the degree he did is absolutely remarkable. But what’s most notable about it is that when he did so rock ‘n’ roll couldn’t hold a candle commercially or critically in the eyes of most to the type of music he was forsaking. Rock offered no real measure of respect, as the more established well-schooled musicians held it in low regard, and while it certainly had the potential to be popular with more uncivilized audiences that dominated the jukebox trade, it had virtually no chance to break into the broader marketplace. Yet he did it anyway. Anyway, the song. Or for starters, the backstory OF the song. 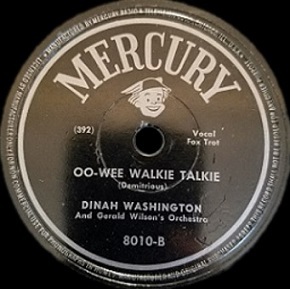 Walkie Talkie was first cut (as Oo-Wee Walkie Talkie) by Dinah Washington in 1946 as a slightly jazzy, somewhat bluesy, but unquestionably POP record (listen to the following Spotify track to hear her take on it before getting to Rhodes for the full effect of the differences we’ll be examining). At the time both this type of song – and the conscious stylistic approach of Washington – were precisely what seemed poised to mark black music’s ascent into the mainstream. Or at least that was the hope. Now of course black MUSIC had always been mainstream, though usually after being apprehended and watered down by white interpreters, with the occasional black originator (Louis Armstrong, The Ink Spots, Duke Ellington, The Mills Brothers, etc.) joining in the hit parade to provide a bit more authentic rendition to keep the white squares from straying TOO far from the original sound. But the consistent popularity in the mainstream of black music by black artists was still very tenuous thing in the mid-1940’s. Oh, it’d been done enough by those aforementioned acts, and a few others of note, to show that it was certainly possible, but it was still relatively rare, as any look at a weekly Pop Record chart would clearly show (in April, 1946, when Washington recorded her version, only an Ella Fitzgerald-Louis Armstrong duet and a Billy Eckstine record cracked the Radio Playlist charts… in the last two slots no less, while Lionel Hampton, whose band Washington had just left, was the only black performer who managed to crack the Pop Sales charts). The assortment of obstacles, from having a core audience comprised of less than ten percent of the total populace and the corresponding cultural prejudices of the remaining 90% that made up the wider consumer base, to the market considerations of the record labels for what they deemed commercially viable, and then on top of all that having a rather limited array of available outlets and venues to promote those records and to host black artists, must’ve seemed all but insurmountable at times. Dinah Washington represented a major opportunity for those forces looking to integrate the nation’s musical tastes. She not only was one of the most skilled vocalists who ever graced a stage but she was incredibly versatile too. With just slight shifts in her delivery she could easily appeal to the specific tastes of a wide array of listeners, all while still retaining her unique persona that would make her instantly identifiable and thus consistently bankable should she break through. By 1946 she had, at least to an extent. Her first two hits – Evil Gal Blues and Salty Papa (both 1944) – had established her as a star in the black community, their mix of smoothness and grit, raciness and class, proving to be intoxicating. But if that was going to remain the essence of her as an artist she’d have little chance to ever seriously contend with the Bing Crosby, Andrews Sisters, Frank Sinatra and Johnny Mercer dominated musical mainstream. So with the core fan-base satiated she (and budding major label Mercury) moved outward, cutting sides that were more sophisticated and diverse, aiming squarely for the white middle-class… IE. the “pop” audience. Among those forays was this song. In Dinah’s hands its mildly suggestive nature is treated playfully, and thus inoffensively, and the blaring orchestra music reinforces the harmless nature of it so as not to frighten off any timid souls still bound by Victorian-era views on the nature of physical attraction. Though not a hit on any chart it sounds like one for the standards of the time, its entire arrangement tailor-made for the broader cross-cultural audience they hoped to pull in. It didn’t quite make it, and maybe because of its compromised stylistic intent it also didn’t appeal to the black audience enough to score with them either, but in 1946 the concessions to white pop listeners wasn’t seen so much as selling out as moving up. Two years later that mindset had begun to change in some quarters. For starters the road to universal acceptance by white listeners for black artists, even when modifying their natural approach in their effort to do so, certainly had not achieved the desired results. The same few names were still making up the bulk of the crossover successes, along with some seemingly random cases thrown in every so often almost as an advertisement for false hope, but there was certainly nothing that pointed to a concerted movement that could be capitalized on by the industry. It didn’t mean that they didn’t continue to try, Washington herself would always flirt with that goal the rest of her career, albeit with few tangible results in the way of pop breakthroughs for most of that time. She wasn’t alone either and during this period we’re in now the likes of Bull Moose Jackson, Paula Watson, The Charioteers, along with some artists we’ve met wandering into the rock realm occasionally such as The Four Tunes, and even full-fledged rock acts such as The Ravens, The Orioles and Ivory Joe Hunter, all heard the siren call for potential pop appeal and headed in that direction with middling results. But as we know something else came along at the same time which provided the opportunity for very REAL success in the growing black musical community, something that thrived on not toning down or whitening up your approach at all, but rather accentuating the cultural differences even further. So for Todd Rhodes the decision to cut this particular song presented something of a stylistic dilemma. Which demographic do you try and cater to? Do you follow Washington’s lead and try to to break the glass ceiling with pop audiences, something which hadn’t even worked for her? Or do you go in the opposite direction and aim at the more hospital constituency, one which Rhodes hadn’t connected with yet when he was laying this track down in late 1947? Keep in mind that whichever one you target almost ensures you’ll never reach the other, not with this record of course, but also with future output if the record companies and audiences used this stylistic choice to confine you to that field going forward. So that was the somewhat dicey question Rhodes was facing – tackle this in a way which had very little track record for reaching across the racial divide to bring a black artist a pop hit, or to strive instead to perk the interest of the burgeoning vibrant rock scene which was encouraging more authentic approaches. Rhodes chose the latter here thankfully (or else we wouldn’t be discussing it of course), but still a bit half-heartedly it seems, as probably could be expected for a late 1947 session before rock had achieved any verifiable successes in commercial avenues. In other words he’s sort of hedging his bets, so call it “tentative rock” I guess. Still, his version of Walkie Talkie is a pretty big leap away from Washington’s pleasant, much more refined approach and therein lies the most important difference. There’s another aspect of this which is interesting to our perspective and that’s Rhodes use of a vocalist for the first time in our meetings with him. Louis Sanders handles the chores here which further allows for a good comparison to the Washington rendition it followed, and thereby maybe giving Rhodes additional ways to re-shape this to suit a new clientele. Before you get too excited you need to know that this doesn’t ramp up the suggestiveness of the content by ANY means, which would’ve been the surest way to set it apart from the Washington version. In fact, there’s undoubtedly LESS innuendo to be found in the delivery of Sanders than what Dinah imbued it with. Part of that of course is the fact that a male imploring a woman to come onto him is far less titillating than a woman doing the same hoping to snag a fella. Sanders doesn’t play it totally straight though, as if he were somehow blindly unaware of what it was he was urging the woman to do in the lyrics. No, he definitely delivers this with a sly undercurrent that he merely masks with a veneer of polite respectability. It hardly makes the record arousing in any way, but it manages to hold your interest. Likewise the musical arrangement is hardly setting the world on fire here either. While it’s far less genteel and straight-laced as Washington’s take on it (or rather thank Gordon Wilson’s Orchestra, who backs her on it), it’s not exactly approaching a rocking sort of anarchy either, replete with riffing guitars, pounding drums or honking saxes to get your motor racing. 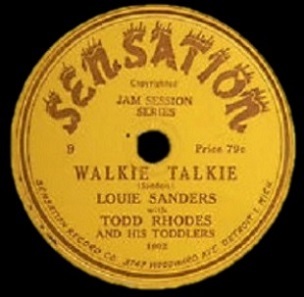 Instead the mood is sort of laid back with the trumpet taking responsorial lines in the verses – vaguely Dixieland in mood as a result – before the break loosens things up a bit with the horns churning out in unison with the sax playing against it to provide the strongest connection to the rock subculture that was gaining traction. 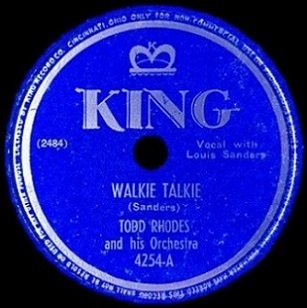 As could be expected for the specific period in which this was cut the overall performance is well behind the times a year later in the waning days of 1948 when King Records re-issued it in the wake of their success with his other Sensation label re-releases. But behind the times for rock doesn’t QUITE mean the same thing as “aiming for pop acceptance” as Washington, just a year earlier, had so shamelessly done. The song itself of course is the same, but one listen to each version and it’s obvious just how different they are, where one mindset ended and another begun. For her part Washington was intent on appealing to an audience who usually would be deemed out of reach for a black artist. She tailors the song to suit their tastes and feel familiar to their sensibilities. Black audiences would be forced to adjust their own preferences in order to embrace it. Rhodes does no such thing. He seems to know that even if he did attempt that same thing he wouldn’t have a chance to succeed commercially with a more pop approach and doing so may in fact hurt the commercial prospects of it in his most likely area of appeal. While he doesn’t dive into the deep end of the rock pool, as we hoped he might, he also doesn’t artificially tone it down so as to tell that audience to steer completely clear of this. Years later the difference, I’m sure, may seem slight (though compared strictly to one another, and not what followed in rock, it should be far more evident), but it’s telling all the same. Washington was the bigger star with black audiences than Rhodes, both at the time and in the years to come, yet she repeatedly tried to becoming even bigger than that by attempting to satisfy the mainstream perception (read: white perception) of what quality music was. Rhodes, and rock ‘n’ roll itself, stuck with an approach that didn’t crave that neutered mainstream respect and cultural relevance as determined by stuffy highbrow music tastes. The ironic part, as I’m sure you all know, is that by doing so, by remaining “true” to the audience that may have been seen initially as more insignificant culturally and commercially, they wound up more culturally relevant and revolutionary, not to mention far more commercial in the long run as well. In fact Washington’s own biggest pop hits came a decade later when she too finally began to make tentative moves into rock-influenced records. By then Rhodes was out of the picture, but his choices early on helped show, in some small way, that the avenue to take out of the commercial ghetto ran through the proverbial cultural and musical ghetto because that’s where the creativity and inspiration was all along, not to mention the excitement. Leave a reply on "Todd Rhodes: “Walkie Talkie”"